In this white paper, we look at five of the critical use cases currently driving HCI deployments and why they will continue to benefit from HCI in 2019 and beyond. 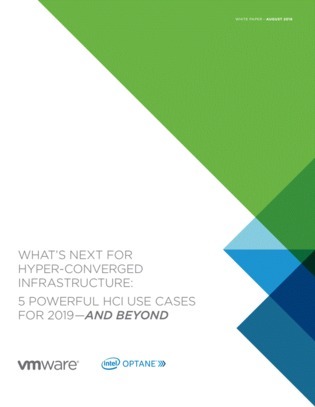 Hyper-converged infrastructure has emerged as a breakthrough IT technology over the past several years. With the right HCI solution, IT teams can lower costs, increase agility and reduce complexity—leveraging a modern software-defined IT platform that provides a seamless path to hybrid cloud. The reality is that IT teams have been so pleased with the benefits they are already reaping with HCI that they are looking for new ways to use it to power key initiatives such as digital transformation. This trend is being accelerated by advances in performance, ease of use and functionality, driven by technology innovations such as Intel Optane memory and VMware vSAN.